This story is about the love of a mother for her children and their incredible respect and recognition of that love. I had the privilege of working with one daughter, who was researching the gift for their Mom's birthday. 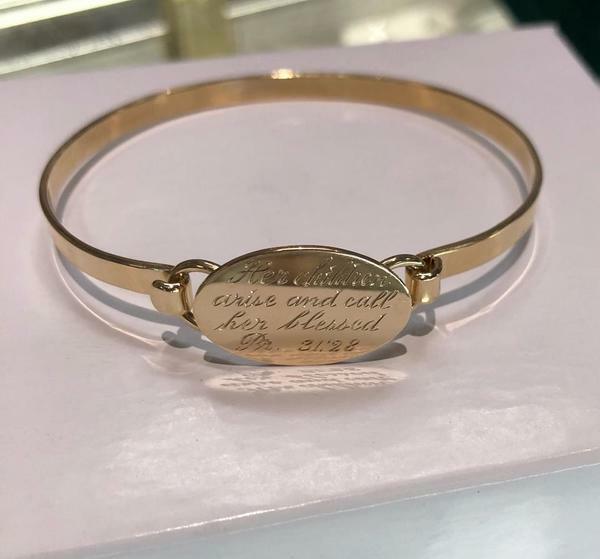 They thought a bracelet that would be easy to clasp and engravable would be perfect. My breath caught when I read the Scripture verse chosen for their Mom; "Her children arise and call her blessed". I truly felt their inspiration; we were simply the mechanics.The bracelet we designed and Jim made, uses the gold engraved disc as the clasp. Our incredible hand engraver completed the verse. I will always remember them for another reason as their Mom shared birthdays with our Mom, on May 19th.